Is this going to be another one of THOSE winters, where snow lovers grovel, beg & plead for a few lousy inches of Minnesota powder? Not sure, and it's probably a little early to panic. December is, in theory, the second snowiest month of the year. 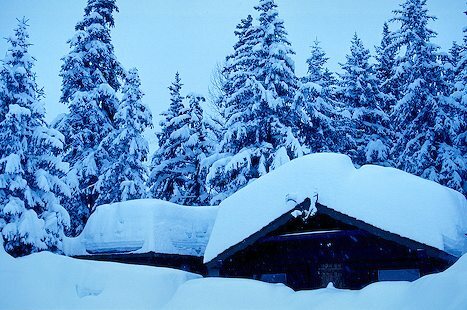 1981-2010 climate data shows an average of 11.5 inches of snow falls this month. So far the metro area has picked up 3-4 inches. Why? To get a major dumping, prevailing jet stream steering winds aloft need to blow from the southwest, from New Mexico, allowing Gulf moisture to bubble northward - with enough cold air holding in place for snow vs. rain. We just haven't seen this setup, but the pattern may change in January, historically our snowiest month. Or maybe February 4? Lonely snowflakes continue to drift overhead; the next clipper may drop another inch of slush Friday night. Temperatures trend above average through much of next week, and latest guidance takes the core of this next arctic front into New England; just a glancing blow of numbing for Minnesota Christmas week. Not record-setting and not that unusual for late December. 84-Hour Snowfall Potential. NOAA's 12 km NAM shows the heaviest snow bands with Friday's clipper from eastern North Dakota and northern Minnesota into the U.P. of Michigan. Amounts will be enhanced by lake effect into the weekend. Snowfall prediction by Sunday morning courtesy of Tropicaltidbits.com. Relatively Mild Next 7 Days. And then a reality check sets in; not even close to record-territory - but by Christmas weekend there will be little doubt in your mind that it's late December as nighttime lows flirt with zero. Twin Cities ECMWF guidance: WeatherBell. Geminid Meteor Shower Peaks. Details from IMO, The International Meteor Organization: "The Geminid meteor shower is the favorite of most meteor observers as it usually provides the strongest display of the year. On the peak night (December 13/14) between the hours of 1:00 and 2:00am local standard time (LST), an observer located in mid-northern latitudes under clear skies has the opportunity to view at least 75 Geminid meteors. If you watch from a rural setting far from city lights then your counts could exceed 100. If watching from urban locations you will be limited to around 50 meteors during this period. The Geminids are one of the few annual meteor showers that are active all night long..."
Huge Trigger of Winter Injuries: Falls on Snow and Ice. Check out the details from CDC: "Each year, millions of older people—those 65 and older—fall. In fact, more than one out of four older people falls each year, but less than half tell their doctor. Falling once doubles your chances of falling again. Adjusted for inflation, the direct medical costs for fall injuries are $31 billion annually. Hospital costs account for two-thirds of the total..."
Statistical Probability of a "White Christmas" in the Twin Cities: 74% So says NOAA, based on the latest 30-year climate data: "Minnesota. Maine. Upstate New York. The Allegheny Mountains of Pennsylvania and West Virginia. Practically anywhere in Idaho. And of course, the Rockies or the Sierra Nevada Mountains. These are the parts of the Lower 48* where weather history suggests you want to be if you're looking for the best chance of a white Christmas. The map at right shows the historic probability of there being at least 1 inch of snow on the ground in the Lower 48 states on December 25 based on the latest (1981-2010) U.S. Climate Normals from NOAA's National Centers for Environmental Information (NCEI). The background map shows interpolated values for all locations. (Interpolating means estimating unknown values using known values and physical relationships, such as the way temperature is known to change with altitude.) You can also click and zoom in to specific stations used for the interpolation..."
Can You Catch a Cold From the Cold? Here's an excerpt of a story from KTHV and 11alive.com: "...Hopkins said while the cold weather doesn’t make you sick and germs do, research suggests that cold weather does create a condition that helps those germs survive. He pointed to a study after study to verify. Publications include Smithsonian Magazine, Pediatric Infectious Disease Journal among other medical studies that all come to the same conclusion. That conclusion is cold temperatures and low relative humidity are favorable to the spread of the flu. And rhinoviruses, which are the most common cause of colds. But what is the science behind your immune system dropping when it is so cold? According to Hopkins, "There are multiple different barriers our body puts up to infections. One is that we have linings in our moist parts of our body – our nose and our mouth. When it gets cold and dry the cells shrink, you may open up the gaps a little bit more between the cells, and you may be able to get more of these viruses through those barriers..."
Alaska Just Reported One of the Most Extreme Snowfall Rates on Record: 10"/Hour. Wow. Here are details from the Salt Lake Tribune: "...Well that's kind of what happened Wednesday at Alaska's Thompson Pass, outside of the town of Valdez, when an incredible 10 inches of snow piled up in one hour - around 1.7 inches every 10 minutes. This is an absolutely incredible snowfall rate. The furious storm dropped another 5 inches in 30 minutes, for a remarkable 15 inches in a brief hour and a half period. In the end, 40 inches of heavy wet snow accumulated in 12 hours..."
Multiple major wildfires continue across parts of southern California Wednesday morning, with over 262,000 acres consumed since last week. The Thomas Fire continues to grow north of Los Angeles. The fire has now burned 236,000 acres and is 25% contained. The fire is the fifth largest in modern California history, and has cost at least $55.5 million dollars to fight so far. 18,000 structures continue to be threatened by this fire according to Cal Fire. Mandatory evacuations remain in place - here are evacuation maps for Ventura County and for Santa Barbara County. Both Ventura County and Santa Barbara County are keeping their local government pages updated with evacuation orders, road closures, and other relevant information like evacuation shelters. The Creek Fire has burned 15,619 acres and is 98% contained. Inciweb has more information. 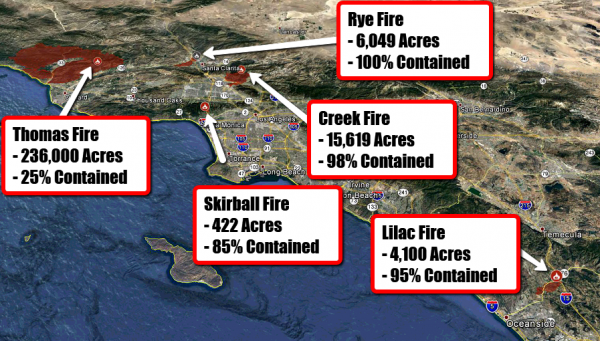 The Rye Fire burned 6,049 acres and is 100% contained. Cal Fire has more information. The Skirball Fire has burned 422 acres and is 85% contained. The Los Angeles Fire Department has more information. The Lilac Fire has burned 4,100 acres and is 95% contained. Cal Fire has more information. The Liberty Fire burned 300 acres and is 100% contained. The city of Murrieta has more information. Elevated fire danger continues today across southern California, with wind gusts up to 40 mph expected. 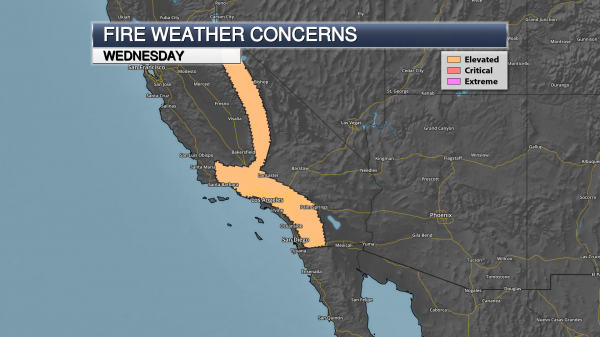 Critical fire danger is expected Thursday, as wind gusts increase to 50 mph. 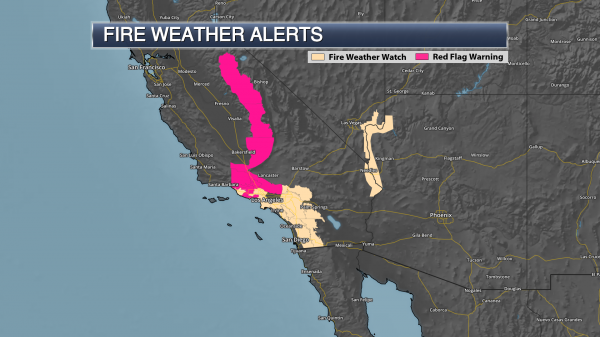 Red Flag Warnings and Fire Weather Watches are in effect through Thursday across these areas. 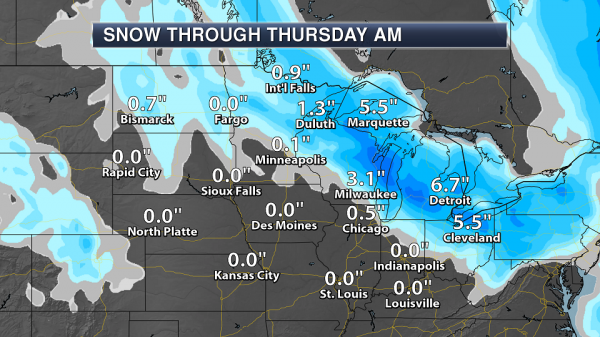 In the Great Lakes region, a clipper system will bring the potential of heavy snow today into Thursday to some areas. Detroit is expected to see over a half a foot of snow. Winter Storm Warnings are in effect. Extreme fire behavior oscillating between wind - and plume - driven runs will continue to hamper control efforts. Firefighters will remain engaged in structure defense operations and scout for opportunities to establish direct perimeter control. Fire will continue to threaten the communities of Santa Barbara, Carpinteria, Summerland, Montecito and surrounding areas. Fireline construction to the north of these communities will continue. Improvement of the Camino Cielo for use as a control line will continue. Contingency groups will improve existing fuel breaks in Santa Barbara County, particularly in the areas of Windy Point and Foothills. Direct line construction, where possible, will continue on the northern side of the fire as well as the establishment of secondary line. In previously burned areas, continued mop -up operations will occur in order to expedite repopulation efforts. The area between Fillmore and Ventura along Highway 126 will remain in patrol status. Strengthening of firelines around the Ojai Valley area will continue, as communities will remain threatened by resi dual hot spots. In the east, outlying areas of Fillmore will remain threatened. Fire personnel will work to construct direct fireline with the support of aerial resources where possible on the east side of the fire. Scouting for establishment of indirect fireline will continue where needed. A detailed, interactive map of the fires can be found HERE. Elevated Fire Danger Continues Today. Santa Ana winds continue across southern California today, with low humidity values and wind gusts up to 40 mph. This will lead to another day of elevated fire weather concerns across the region. Elevated fire concerns extend into the Sierra as well, mainly due to low humidity values being transported west from the Great Basin. Wind speeds will generally be around 10 mph in the Sierra. Critical Fire Danger Thursday. The weather pattern changes as we head into Thursday as a system moves into Arizona. However, this will strengthen the winds across southern California Thursday. Wind gusts will be up to 50 mph across the region and that - combined with low humidity values - will lead to critical fire weather conditions. 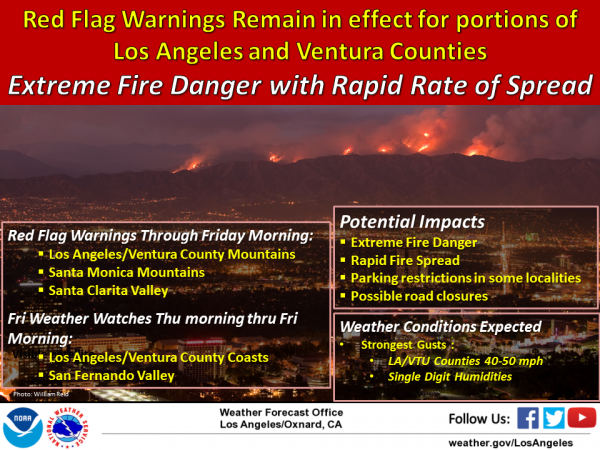 The Los Angeles/Ventura County Mountains, Santa Monica Mountains and Santa Clarita Valley through Friday morning. In these areas, winds will gust to 40 mph today and to 50 mph Thursday. Parts of the Sierra Nevada (including Yosemite) and Kern County Mountains through this evening. In these areas, the main concern is the low humidity values that would allow fires to quickly spread. 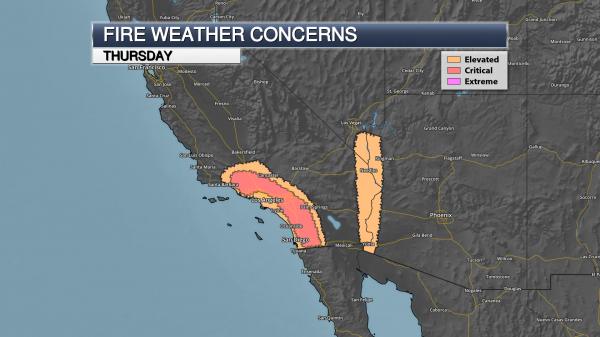 Fire Weather Watches are in effect Thursday into Thursday Night for the Los Angeles and Ventura county coasts, the San Fernando Valley, the Colorado River Valley and parts of San Bernardino, Riverside, Orange and San Diego counties. Wind gusts are expected to be between 40-50 mph tomorrow, with occasional gusts to 65 mph across southern California. Smoke Impacts Continue. 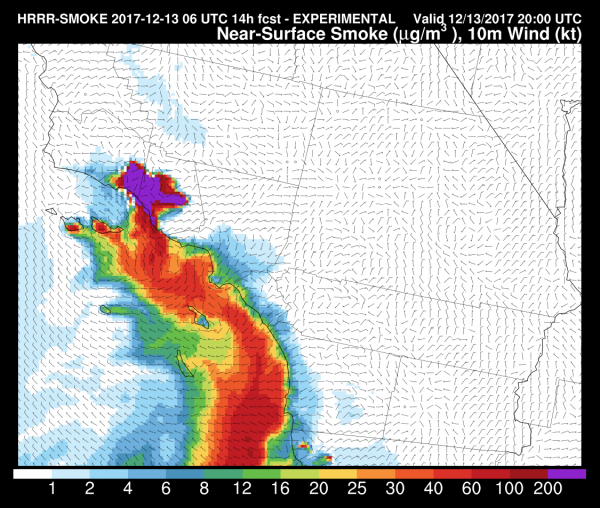 Poor air quality is once again expected today across the region due to the smoke from the Thomas Fire. This is the near-ground smoke forecast for Noon today. Heavy Great Lakes Snow. A clipper system moving through the upper Midwest and Great Lakes over the next 24 hours will produce the potential of heavy snow as it moves through. Snow accumulations of 6-9” will be possible from Green Bay, WI, across central Michigan, including Detroit, by Thursday morning. Areas like Detroit, Cleveland and Pittsburgh will likely see impacts to the evening commute due to the snow. Advisories And Warnings. 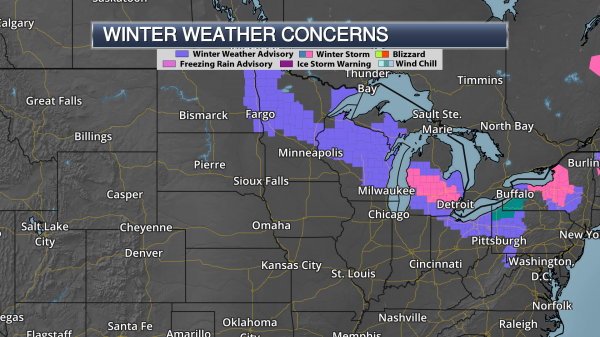 Due to the potential of heavy snowfall amounts as this clipper moves through, Winter Storm Warnings have been issued for parts of Michigan, including Detroit. 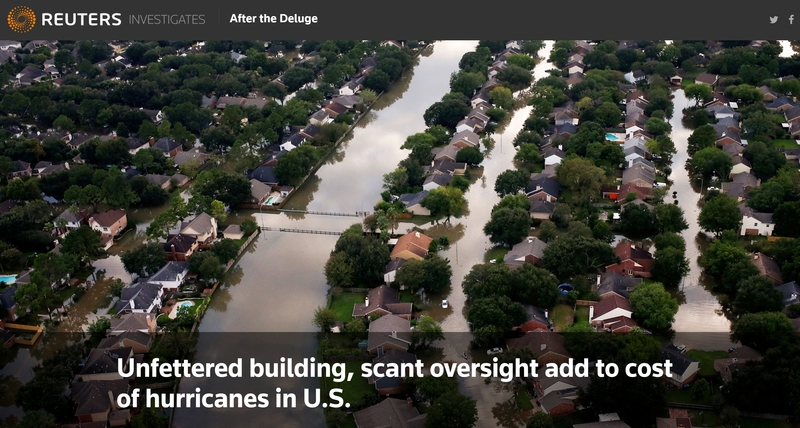 Unfettered Building, Scant Oversight Add to Cost of Hurricanes In U.S. Reuters investigates: "...Across the country, newer construction in flood-prone areas generated more than $9 billion in claims for structural damage on the cash-strapped flood insurance program between 2000 and 2015. 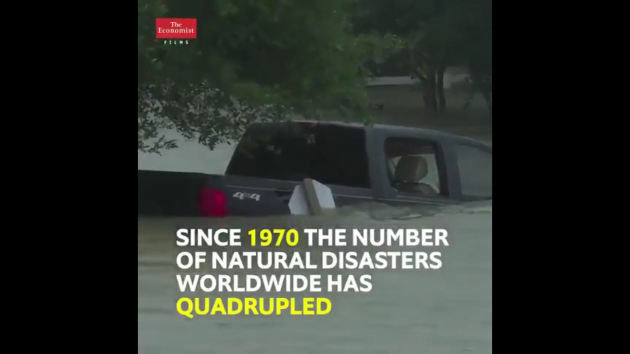 Flood-management authorities say that some of those claims probably never would have been filed had proper building controls and accurate flood maps been in place. “You look at the media images and you see new subdivisions, new strip malls and new buildings with water up to the rooftop. Those are red flags in my mind. Those shouldn’t be happening,” said Paul Osman, floodplain program manager for the Illinois Office of Water Resources. Controlling construction inside flood-prone areas is critical to keeping flood insurance affordable and reducing post-disaster costs, federal officials say..."
Photo credit: "UNDER WATER: Hurricane Harvey caused billions of dollars of flood damage in August in Texas, including this area of Northwest Houston." REUTERS/Adrees Latif/File Photo. The Loss of Arctic Sea Ice Cover Could Affect Millions Worldwide. Turns out what happens in the Arctic doesn't stay in the Arctic. A story at Futurism connects the dots: "...Far from just being bad news for polar bears or vulnerable island chains, melting Arctic sea ice caps can affect areas a long way from the Arctic region, bringing not only higher sea levels, but also severe drought. This may be the case for California, which could see its already extreme lack of water getting worse in the coming decades, according to researchers at the Lawrence Livermore National Laboratory. In a study published on November 5 in Nature Communications, climatologist Ivana Cvijanovic and her team found that shrinking glaciers in the Arctic can modify atmospheric temperatures over the tropical Pacific. In turn, this heat imbalance can push rain-rich clouds away from California towards Alaska and Canada..."
Alaska Weather Service Cuts Balloon Launches Due to Staffing. U.S. News has an update on a development that may, in theory, impact forecast accuracy thousands of miles downwind, over the Lower 48 states: "Workers at 13 Alaska sites are supposed to release balloons twice a day that collect data on temperature, pressure and wind, but the National Weather Service has reduced weather balloon launches in rural Alaska, affecting the quality of forecasts. Launches have been limited in recent years by staffing shortages and by an overtime policy change in August, the Fairbanks Daily News-Miner reported . The Weather Service has launched 28 percent fewer balloons at six of the remote sites in order to keep employees to a 40-hour work week. The loss of any input data affects weather models, but the degree it hurts the accuracy of forecasts isn't easy to quantify. 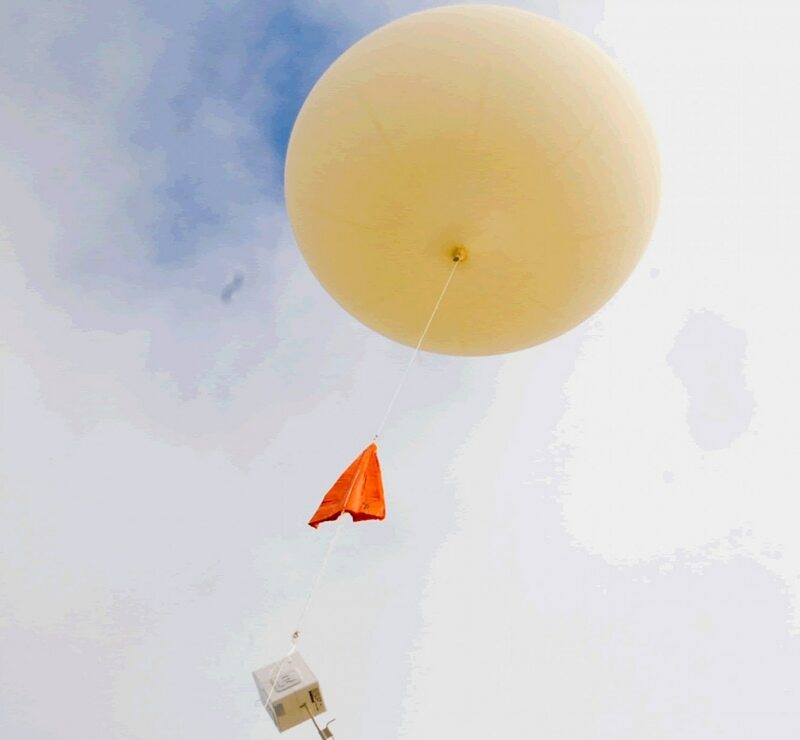 The Weather Service supplements data from weather balloons with data from satellites, Weather Service Alaska Region Director Carven Scott said..."
How The Way We Think About the World Failed. No, more stuff does not equal more happiness or contentment. Here's an excerpt of an eye-opening post at Eudaimonia and Co: "...Only a minority of people feel their lives are better today than they might have been fifty years ago. In response, the intellectuals I follow tweeted something like: “these foolish people! Don’t they know how good they have it! They should be happy!! What’s wrong with them? !” Their words dripped with the strange hallmark of what passes for thought today: hubris, arrogance, pride, and derision. Fascism, authoritarianism, and tyranny can only really arise when our institutions fail, and among the most important of these is the way we think. It’s no overstatement to say today that thought itself has failed — witness daily the constant, perpetual surprise outrage of pundits and intellectuals, whose inability to explain or predict the world anymore is expressed in a furious anger which soon turns to disdain..."
216 Companies on the Fortune 500 List Were Founded by Immigrants or Their Children. Here are a couple of clips from Quartz: "...Of the companies that made the list in 2017, 43% were founded by an immigrant or the child of an immigrant, according to research from the Center for American Entrepreneurship. The share of immigrant founders in technology is even higher, 45%—though there are immigrant entrepreneurs are represented in every sector… People born in other countries and their children have continued to feed the Fortune 500 list in more recent decades. Apple founder Steve Jobs, the son of a Syrian immigrant, and Russia-born Sergey Brin from Google—and its parent Alphabet—are among the most famous. But there are other relatively new companies with immigrant ties. Marc Randolph, one of Netflix’s founders, is the son of an Austrian immigrant. Sol Barer, a German immigrant, helped start biotech firm Celgene…"
How Tech Companies Could Keep the Workforce Alive. Think your job is safe from automation and AI? A story at The Atlantic caught my eye: "...Jobs in industries such as food services, transportation, and retail trade are at high risk of being automated, forcing workers to gain new skills to compete for well-paying jobs. From Google’s self-driving cars to Apple’s communication technology to Amazon’s retail model, automation is becoming more and more pervasive. As communities across the U.S. witness growing gaps between the skills that workers have and the ones that employers need, workers will need training. Debate about how to prepare workers for the future has largely focused on what educators and employers are doing and could do more of..."
Google's True Origin Partly Lies in CIA and NSA Research Grants for Mass Surveillance. Lovely. Quartz has the story: "Two decades ago, the US intelligence community worked closely with Silicon Valley in an effort to track citizens in cyberspace. And Google is at the heart of that origin story. Some of the research that led to Google’s ambitious creation was funded and coordinated by a research group established by the intelligence community to find ways to track individuals and groups online. The intelligence community hoped that the nation’s leading computer scientists could take non-classified information and user data, combine it with what would become known as the internet, and begin to create for-profit, commercial enterprises to suit the needs of both the intelligence community and the public. They hoped to direct the supercomputing revolution from the start in order to make sense of what millions of human beings did inside this digital information network. 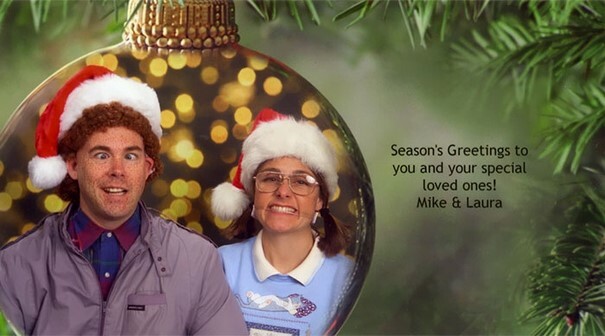 That collaboration has made a comprehensive public-private mass surveillance state possible today..."
Family Sends the Most Awkward Christmas Cards for 15 Years, and It's Too Funny. After seeing this post at Bored Panda I have to agree: "If you think you’ve already seen the funniest family Christmas card of the season, think again. Every year since 2003, the Bergeron family has been ringing in the holidays by producing the most clever and hilarious greeting cards we’ve ever seen, and just like the snow outside, they’re showing no signs of stopping. Mike Bergeron, his wife Laura, and their two daughters known online as ‘Gigi’ and ‘Juju’ have made an annual tradition out of the refreshingly original photoshoots, and each December, they choose a new knee-slapping theme. Whether they draw on pop culture, local culture, or embarrassingly awkward family cards of yore, they always seem to pull it off as a team. Special credit is due, of course, to the JC Penney Portrait Studio, which has seen them all the way from ‘white trash Christmas’ to a full drag ensemble..."
Andrew Zimmern Heads Up Minneapolis Food Hall. GoMN has the tantalizing details: "Minnesota's culinary king has signed on as the first tenant of The Dayton's Project – a $250 million makeover of the historic Dayton's building on Nicollet Mall that, when finished, will include offices, retail stores, a gym, a library and the food hall. According to a press release from developers, The Dayton's Food Hall and Market will be a "mix of well-known food vendors, local treasures, fresh food purveyors, and food makers creating a market that will be the first of its kind in the Twin Cities...Zimmern is hoping to create a food adventure similar to many European food halls and markets, where visitors can sample food from local vendors and shop for things like fresh meat and seafood, artisanal cheeses and fresh baked goods from local purveyors..."
Image credit: "An artist's rendering of The Dayton's Food Hall and Market." Tunheim. 30 F. high on Wednesday in the Twin Cities. 27 F. average high on December 12. 10 F. high on December 13, 2016, after waking up to -7 F.
December 14, 1996: Snowfall exceeding one foot is reported from south central Minnesota through portions of the Twin Cities metropolitan area. Some of the higher snow totals include 15 inches at Rockford, 14 inches at Cedar and North Branch, 13 inches at Stewart and 7 to 10 inches across the central and southern parts of the Twin Cities metropolitan area. December 14, 1933: A severe ice storm hits southeast and central Minnesota. Scientists Link Hurricane Harvey's Record Rain to Climate Change. A warming atmosphere made the probability of Hurricane Harvey's 50"+ rains as much as 38% more likely, according to 2 new studies highlighted at The New York Times. 3-Day Hurricane Harvey radar loop with 2-minute updates from August 25-28, 2017, courtesy of AerisWeather. Climate Change to Affect City and State Credit Ratings. Here is an excerpt from an Op-Ed from San Antonio's Express-News Editorial Board: "Cities and states, take note. Climate inaction could lower your credit rating. A recent report from Moody’s explains how the rating agency will assess climate change risk for states and cities. Risk indicators include economic activity along the coast, potential for hurricane and other extreme-weather damage, and the number of homes in a floodplain. Moody’s didn’t identify cities in its report, but Texas is one of the states deemed most vulnerable to climate change. Not surprising since Texas has tremendous economic activity along the Gulf Coast and is prone to all sorts of extreme weather across the state. Hurricane Harvey, which slammed into the Coastal Bend before dumping more more than 50 inches of rain on Houston, has caused an estimated $180 billion in damages. Many of the properties damaged were not in designated floodplains, raising questions about whether our mapping and flooding expectations are accurate in light of climate change..."
Photo credit: Bryan Thomas, New York Times. "If your community isn’t taking affirmative action on climate change, its credit rating could be at risk. For years, Houston, which suffered grievously during Hurricane Harvey, has paved over much. Has it done enough to stem climate change?" To Test for Climate Disasters: Break, Burn and Throw Stuff. The New York Times reports on how the insurance industry is preparing for a new generation of super-storms, extreme weather events and natural disasters. Did Climate Change Worsen the Southern California Fires? A warmer, drier climate was one of multiple reasons why the fires have been so bad, according to a story at The Atlantic: "...The answer isn’t as clear-cut as it was this summer, when drought- and heat-stoked fires raged across the Rockies and Pacific Northwest. 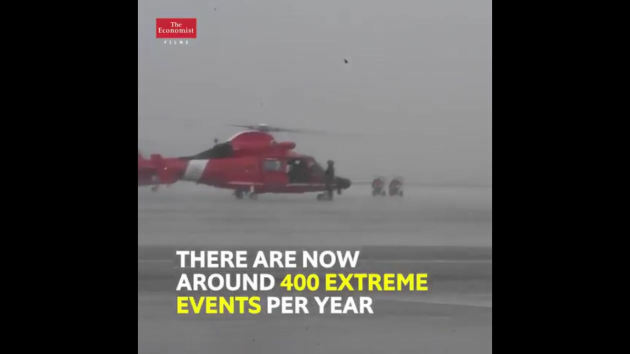 Instead, a mix of forces are driving the fires in Southern California, and only some of them have a clear connection to global warming. “These fires are not immediately emblematic of climate change,” said John Abatzoglou, an associate professor of geography and climate at the University of Idaho, in an email. “Yes, California did have the warmest summer on record. But the big anomaly here is the delay in the onset of precipitation for the southland that has kept the vegetation dry and fire-prone.” In other words, late-fall and winter rains would normally end California’s fire season in November. Because those rains haven’t yet arrived, the blazes continue..."
Wind Energy Is Supposed to Help Fight Climate Change. It turns Out Climate Change is Fighting Back. A tortured headline, sure, but the gist of the article at The Washington Post: a rapidly changing climate may be changing where wind power works best over time: "...But the second study, published Monday in Nature Geoscience and apparently the first comprehensive look at wind energy resources under climate change, projects forward to the future using 10 climate change models. And it finds more of the same across the mid-latitudes of the Northern Hemisphere — a key area for wind energy installation from the United States to Europe to China — even as under some scenarios, the models show a growth of wind resources in the tropics and the Southern Hemisphere. “What we found is that global warming will reduce the wind energy resource across much of the Northern Hemisphere, especially in the central U.S.,” said Karnauskas, who conducted the work with university colleagues Julie Lundquist and Lei Zhang..."
Photo credit: "Rays of sunlight try to break through darkening clouds over a wind farm near Waverly, Kan., on Nov. 28." (Chris Neal/Topeka Capital-Journal via Associated Press).